2014: ilastik 0.5 is outdated and no longer supported or improved. The brand new ilastik release 1.1 is waiting for you to try it. If we missed some important feature when porting ilastik 0.5 functionality to the new ilastik 1.1, please let us know and we'll do our best to replace it. ilastik is a simple, user-friendly tool for image classification and segmentation in up to three spatial and one spectral dimension. Using it requires no experience in image processing. 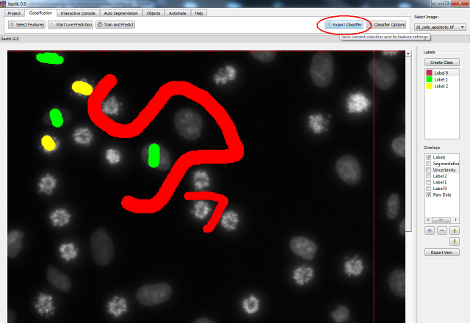 ilastik has a convenient mouse interface for labeling an arbitrary number of classes in the images. These labels, along with a set of generic (nonlinear) image features, are then used to train a Random Forest classifier. In the interactive training mode, ilastik provides real-time feedback of the current classifier predictions and thus allows for targeted training and overall reduced labeling time. In addition, an uncertainty measure can guide the user to ambiguous regions of the data. Once the classifier has been trained on a representative subset of the data, it can be exported and used to automatically process a very large number of images. The features are computed in the full 2D/3D/4D pixel neighborhoods, depending on the available data. While the provided set of features includes popular color, edge and texture descriptors, the plug-in functionality allows advanced users to add their own problem-specific features. Feature computation and classifier prediction are multi-threaded and fully exploit modern multi-core machines. 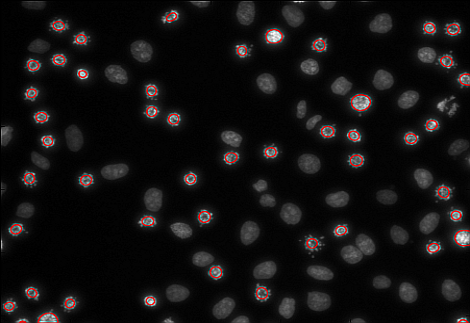 So far, we have used ilastik successfully on applications from the neurosciences (segmentation of EM images), systems biology (high throughput screening experiments) and industrial quality control. The classification workflow is ilastik's first and most well known use case. 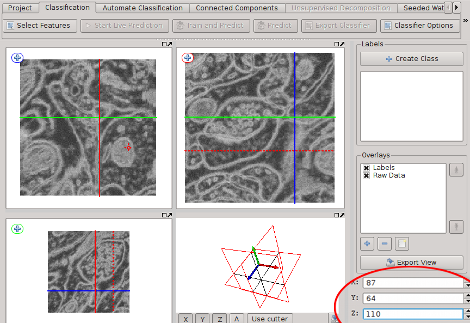 This video shows the standard workflow for 2D images for the example task of cell classification. It introduces basic navigation and control shortcuts. This video shows the standard workflow for 3D volumes for the example task of neuron classification is isotropic volumes. It introduces the basic navigation in 3D images and explains the use of the uncertainty overlay. The carving workflow of ilastik is an interactive segmentation workflow working on a supervoxel representation of the data using a modified watershed algorithm for processing to improve segmentation results. 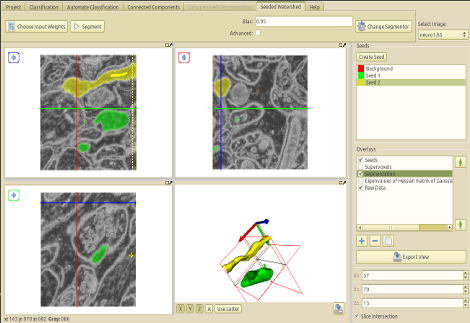 The 2D slice views of the segmentation only request the dense segmentation results for the currently visible parts. Thus the complete pipeline accesses the full dataset only once during dataloading/preprocessing - all other parts make full use of the sparse representation and provide a very responsive user experience. 2014-03-13 - ilastik 1.0 is now available as a beta release! 2012-07-09 - ilastik 05 final release now available for linux! 2012-06-29 - ilastik 05 final release is out for Win and Mac, Enjoy! ilastik bases its predictions on local properties. Problems that require global context or relative configurations of parts cannot be solved with ilastik.